Looking down on the brilliant orange seats, and crisp green grass below me, two thoughts fight for dominance in my skull. The first is concerning all of the terrible losses that have taken place in this stadium throughout a truly depressing season, and the second is how unbelievable it is to be standing on top of First Energy Field. I grin for a moment thinking how much a seat like this would cost me in the real world before turning away from one of my childhood haunts and flinging myself into the sky and soaring between the familiar grey and brown buildings of Cleveland. I haven’t seen my hometown in almost a year but even the pull of nostalgia isn’t enough to keep me entertained forever. In the blink of an eye the world around me dissolves and the restaurants of East Fourth Street are replaced by the brilliant purple face of Japan’s Mt. Fuji. I aim for the lid of the famous mountain’s bowl-shaped depression and land smoothly on the craggy ground. Turning slowly I can almost feel the wind in my hair but I know that couldn’t be possible. This is not the real Mt. Fuji. This is Google Earth VR. And I never, ever want to leave. Google Earth VR is a surprise project from Google’s Geo team that is being both announced and released today. This is the team behind Google Maps and the original Google Earth. The group has spent the better part of a decade collecting and cataloging an obscene amount of visual data from all over the planet. Now, all of that information is being used to create a VR experience that can take you almost anywhere on Earth you want to go. According to Mike Podwal, project manager for Google Earth VR, “94 percent of the world’s population is covered in this experience. 54 percent of the Earth’s land mass is covered. There are around 175 cities with full, 3D data, and over 600 ‘urban cores’ as well.” Google Earth turns all of this data into completely explorable, scalable 3D immersive worlds for the HTC Vive VR headset. As an explorer, you begin your journey looking at the Earth from space. From there you can rotate the globe and choose where to begin zooming in. I choose Africa and within minutes I am hovering a few hundred feet off the ground of a barren desert. With the press of a button I pull up the menu and choose Manhattan from a list of notable places. In a second I am miles above the city, and by pointing my Vive controller this way or that and clicking the pad with my thumb, I soar anywhere I choose in the bustling virtual metropolis. 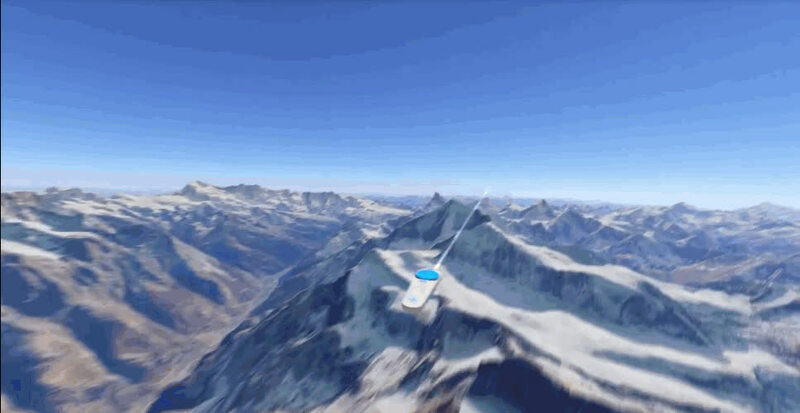 Google Earth VR’s primary locomotion system is flight. Podwal explained that his team didn’t feel that the standard locomotion systems of teleportation or joystick walking would work for this particular project. They want you to feel and remember the journeys you take as you devour every corner of the places you are exploring. Initially, the experience gives you a comfort mode in which your FOV is narrowed as you fly to reduce simulator sickness. This can be disabled in the options menu for those that prefer more uninhibited traversal. Freedom is what makes Google Earth VR such a truly powerful experience. Yes the visuals still need updating — when you fly all the way down to “human scale” things tend to take on a bit of a Nintendo 64 aesthetic — but that limitation pales in comparison to the sheer possibility of this platform. For example, at one point I landed on the roof of some random building in New Jersey. It was ugly and completely forgettable. But it was here. It existed in the real world and I could go to it in this virtual one. The one-to-one representation made possible by year after year of Google’s continuous visual data gathering has now led to the most incredible map mankind has ever seen. Google Earth VR does not require an army of animators to build each building in San Francisco through Unity or Unreal Engine 4, it is fueled by an always refreshing data set from one of the world’s most powerful sources of geographical information. 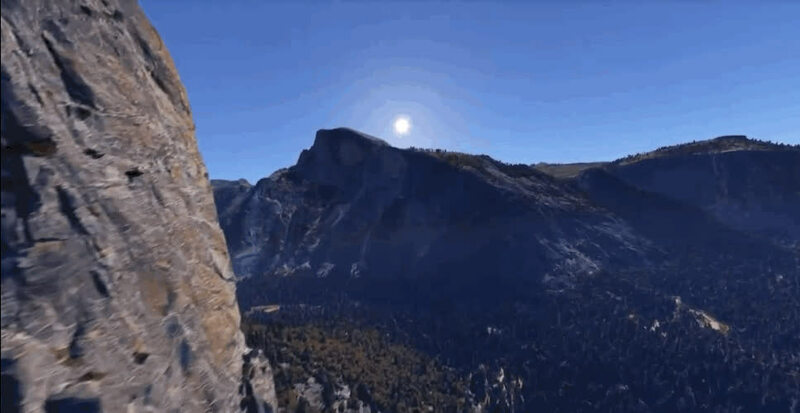 That type of power makes the full implications of Google Earth VR truly staggering. According to Dominik Kaeser, the project’s engineering lead, Google Earth VR began four years ago as a “20 percent project.” Google encourages its employees to spend 20 percent of their time at work on outside projects that could help extend the company’s steadily widening portfolio of products. Kaeser was on the Geo team at the time and realized that the data his group was amassing could combine with VR into something truly special. Google Earth VR now has its own team that works with Clay Bavor’s Google VR squadron as well as the remaining Geo team members. Podwal explained that this newly minted group will be working consistently to add new features, increase the visual fidelity and expand the already massive world. Google Earth VR is like nothing else available today. the scope and overall philosophy are one of the VR scene’s first truly immersive spaces. There is always a game to play or a movie to watch inside a VR headset, but there are very few places at this point to simply be. Google Earth VR is one of the first and, so far, it is definitely the best. The app is available now for free on the HTC Vive. When asked about support for other platforms, such as the Oculus Rift, Podwal stated that the team was actively looking into ports but had nothing to announce.